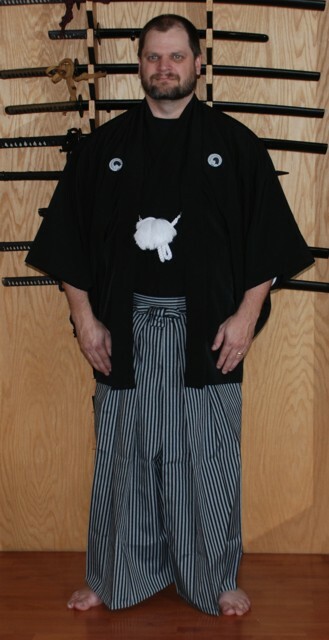 Nihonzashi offers a uniform that is great for demonstrations, competitions, or any other formal event. The set includes Montsuki Kimono, Haori, Hakama, Juban, and Haori-himo. Your uniform will be customized and sent from Japan, so please allow a few weeks for delivery. A library of standard Kamon (family crests) is available. If you do not find a kamon that you like, we can also accept a bitmap image for custom kamon. Montsuki Kimono are used for special occasions. This is not a full length Kimono and intended to be worn with Hakama. Haori are light coats worn over kimonos. While these were originally used to keep from being exposed to the elements, they are now considered an important part of formal attire. They are much like a western suit coat. Hakama resemble a wide pair of trousers. They have a koshi ita, which is a stiff or padded part in the lower back of the wearer. 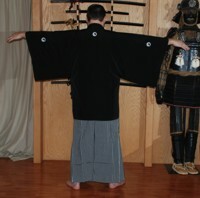 Hakama are worn in several budo arts such as aikido, kendo, iaido and naginata. These are formal with a striped grey and black pattern. The juban is an under-Kimono made of light white fabric and designed to keep perspiration off of the more expensive Kimono. Haori-himo is a tasseled, woven string fastener for haori. These are white which is the most formal color. This is synthetic silk uniform. The white Juban can be machine washed. We recommend dry cleaning of all other elements of the uniform except the Haori-himo. Kamon are iron-on transfers and may be damaged by some dry cleaning. We do offer replacement Kamon.